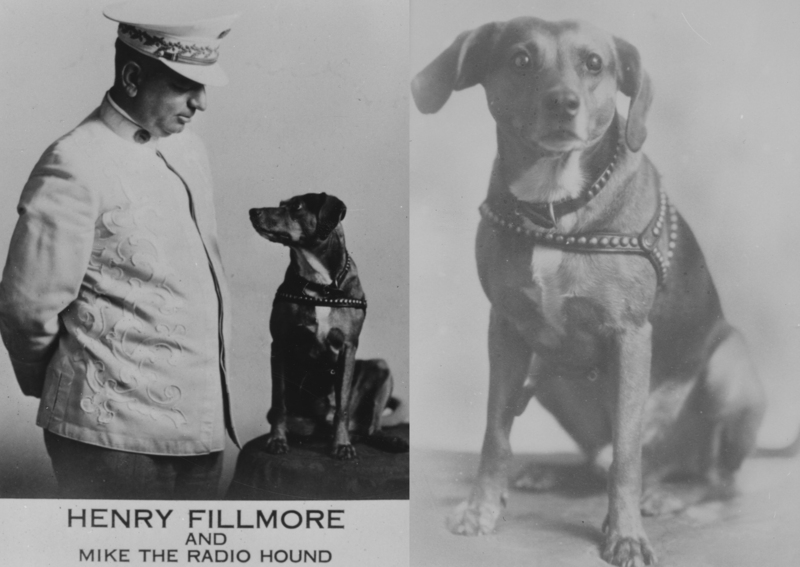 Henry Fillmore and Mike “the Radio Hound” Promotional Photographs, ca. 1930. The Sousa Archives newest exhibit, “Henry Fillmore: The Man Behind the Name,” opens today to kick off this November’s American Music Month celebration, Klaxons, Screamers, and Rolling Thunder: The Unconventional Henry Fillmore. Fillmore was an unconventional trombonist, composer, and bandmaster who loved circus music, American football, and his music-loving dog. The hustle of Cincinnati’s river wharves, and his and Uncle Fred’s love of the many circuses that passed through town often distracted the young Henry from the drudgeries of school, piano lessons, and the weekly trips to church. The trombone fascinated him the most because it always led the circus band, but his formal trombone lessons were short-lived and his unruly teenage humor continued to embarrass his family. Returning to Cincinnati homesick after running away with the John Robinson’s 10 Big Shows Circus, Henry’s father agreed to send him to the Miami Military Institute to complete his education. After graduating from the Institute in 1902 he was given a position in his father’s church hymnal company, but he wasn’t happy unless he was playing his trombone. In 1904 Henry fell in love with Mabel May Jones, an exotic vaudeville dancer he saw performing at the St. Louis World Exposition during the family’s summer vacation, and he eventually married her much to his parents’ disdain. To escape tensions with Henry’s parents the couple joined the Lemon Brothers Circus where Henry was responsible for playing the trombone and leading the circus band. Eventually the newlyweds returned to Cincinnati in 1905 and Henry rejoined his father’s publishing company as the manager of its new bands department and the Fillmore music instrument store. As Henry’s reputation as a band leader, trombonist, and composer continued to grow over the next thirty years, his love of the music, colorful spectacles, and ringmaster attention of the circus were continually reflected in his new compositions like The Circus Bee march written in 1908 and his many virtuoso trombone smears beginning with Miss Trombone also written in the same year. His performances as director of the Shrine Temple Band between 1921 and 1926, and later with his own Fillmore Band for Cincinnati’s WSAI Radio Station’s coast-to-coast broadcasts between 1927 and 1930 which featured his musical four-legged friend, Mike, the “Radio Hound” also reflected his excitement for all things related to circuses. This exhibit explores through photographs, original music, and sound recordings the life of Henry Fillmore and his love affair with the slide trombone.